Challenge: Manual processes and excel spreadsheets made building a robust talent pool and managing crew both time consuming and difficult. 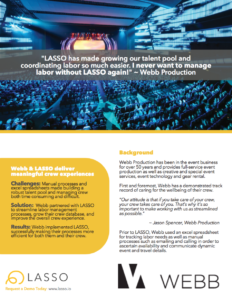 Solution: Webb partnered with LASSO to streamline labor management processes, grow their crew database, and improve the overall crew experience. Results: Webb implemented LASSO, successfully making their processes more efficient for both them and their crew. Download the full case study to learn more! Click here to download the full case study.